FALL RIVER — The Fall River Diocese will offer its annual Women and Men’s Conference on Saturday, March 9, with a program featuring nationally-noted speakers, prayer, music, Adoration, Mass, and more. It will take place on the grounds of Stonehill College in Easton. Speakers will be Boston Auxiliary Bishop Robert Reed, who is president of the CatholicTV Network; Dr. Mary Healy of Sacred Heart Seminary in Detroit, a professor of Sacred Scripture there and an international speaker on Scripture, evangelization and the spiritual life; and Deacon Pedro Guevara-Mann, a radio and TV producer, writer, and host from Salt and Light Media of Canada. Bishop Edgar M. da Cunha, S.D.V., will be celebrant and homilist of a Mass at 4 p.m. to conclude the day. 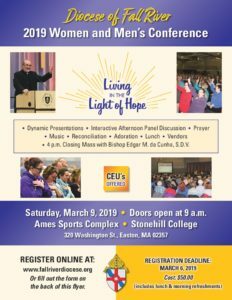 The Women and Men’s Conference will take place in the Ames Sports Complex at Stonehill College, with doors opening at 9 a.m. The program will get underway at 10 a.m. and include a midday break with lunch, and time to visit the many vendors that will be on hand. Registration for the conference is required. The deadline is March 6. Continuing Education Units (CEUs) are available. For more information, including registration and cost, visit the Women and Men’s Conference webpage or pick up a flyer at any parish in the diocese.